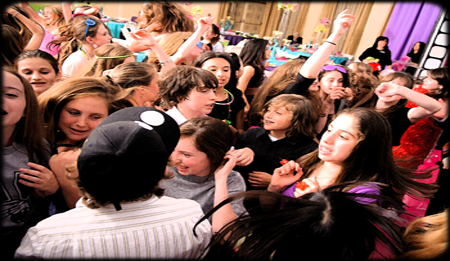 Our Bar & Bat Mitzvah packages include an Emcee, a DJ and your choice of interactive dancers. Properly staffing your event is the key to our success – all of our Bar/Bat Mitzvah performers specialize in these events, and perform at 5-9 parties each weekend during the Mitzvah season. With Energy, you get staff that is fully educated and trained on the knowledge needed to celebrate Jewish events. Furthermore, each of our staff members possesses strong leadership skills which assure the kids stay in control, while still having a great time at the celebration. Our Bar & Bat Mitzvah clients are given access to online-party planning software which will help guide you through every step of the event planning process. Additionally, our full-time staff of event coordinators is always a phone call or email away to help answer any questions you may have about planning your party; whether related to entertainment or not, we are always willing to assist in the planning of your son or daughter’s special day! Our Bar & Bat Mitzvah clients have a choice! 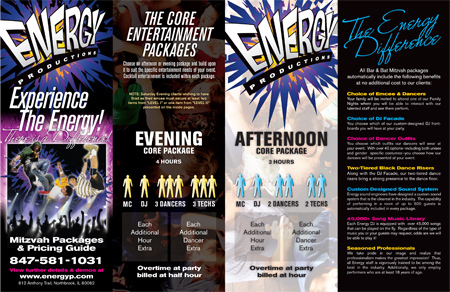 From the moment you book Energy, the details of your party are up to you! While we have a unique system of planning which contributes to the success of your party, we are always willing to accommodate your special requests – whether staff, music or general timeline related. Additionally, through attending one of our bi-monthly family nights and a personalized confirmation meeting, you will be given the opportunity to choose which of our staff performs at your event, as well as which DJ Façade will act as the focal point of your dance floor, which of over 40 outfits our dancers will wear and which staging options are best for your party environment. 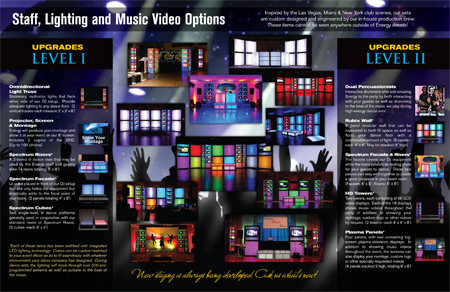 We make the entertainment selection of your Bar & Bat Mitzvah party very easy! Choose one of our two core packages – either afternoon or evening – and build upon it to suit your event needs and budget. "Our guests, kids & adults, raved about the music, the dancers & the flow of the party. We've been to a lot of bar & bat mitzvahs over the years, and you guys are truly the best!" "I wanted you to know that we absolutely loved working with you on Sydney's Bat Mitzvah! The intro dance you guys came up with was spectacular - people cannot stop raving about it and how great you were." "Wow! Amazing! Incredible! So fun! Those are the many comments that we heard about our daughter's bat mitzvah party. Once again, you have totally outdone yourselves! Your energy, enthusiasm, amazing dance moves & organization helped make the night so memorable." "We want to thank you again for your care and interest in our family and our event, before, during and after our party. You were not only very professional, but also very thoughtful and empathetic at all times." "You did such a fantastic job of keeping the kids entertained and getting the adults up and dancing! We can't thank you enough!"